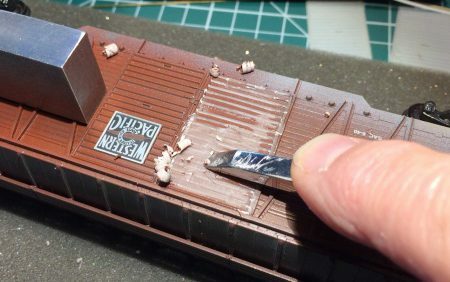 The project starts with a box car kit, new doors, styrene, and an assortment of detail parts. 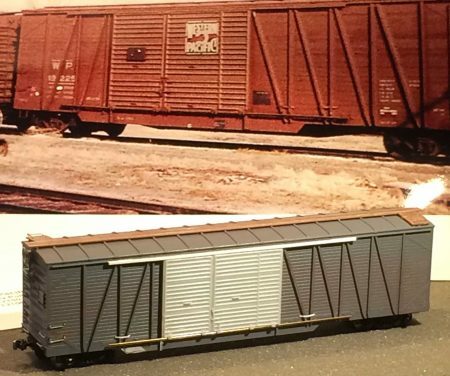 The basis of this conversion is a $10 plastic MDC/Roundhouse car that was based on the original Pullman-WP drawings. Roundhouse made two versions: one with steel auto doors at one end and one with a lumber door. It’s the lumber door version that is needed for the 15-foot door conversion. 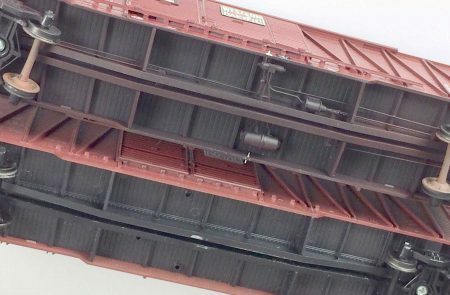 The beautiful WP shield is molded into the door ribs. It should be installed on top of the door ribs. I shaved off all those items and replaced them with various parts available on the market. Shaving off the doors is a tedious but rewarding job. The diagonal brace seen under my finger in the photo above also needs to be removed. The side sill will be elongated with some strip styrene. The original doors were replaced with assembled Intermountain 6-foot Youngstown doors. These lay on top of the side bracing. The cast-in rollers were made free standing so they could ‘grab’ a brass L-profile rail sanded more acceptable proportions. The top rail is a piece of styrene. Fred kept prototype images handy to guide the detail work. Note the side sill extension to the left of the doors. Brass grabs, plastic NBW’s, ladders, guides for the doors, brake details at the end were all added. The original end tack boards were left in place. The running board was sanded thin and added wood-structure to top. Lateral grabs and supports, and end supports were installed. The original MDC underframe is on the lower part of this photo. In comparing the two models, the upgraded car at the top shows the new lower door rail and doors laying on top of the bracing. The AB brake system detail parts are a mix from IM, Tichy and Grandt Line. Despite the very low side sill I chose to install a complete AB brake system and Tahoe Model Works Barber lateral motion trucks. Kadee #58 couplers, cut levers and air hoses were added. For paint, I chose Tru-Color WP red for the car body, with the underbody and trucks painted black. Decals are a mix of Microscale, Speedwitch Media, and an old, thick Walthers set for dimensional data that came rather close. After the lettering was done I found the 1950 ORER lists a few cars in series 19201-19250 that did NOT receive the wider door openings and WP 19207 is one of them. 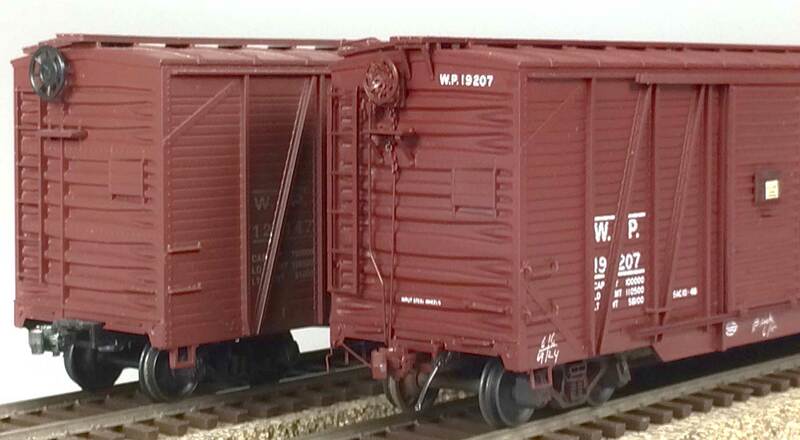 Glad I haven’t dullcoated the model yet as I’ll change the car number to WP 19227. I followed the prototype to install more details. Small black rectangles with ‘tack cards here’ were added. Also a brake release handle and half white circle indicating its place on the side sill. Waybills and tack cards were found on the internet and reduced and printed to scale. A few small details, such as like door stops and lower door handles remain to be installed. The model needs a touch up here and there before Dullcoat is applied. It will be weathered, of course! Here’s another comparison with the stock MDC model on the left and Fred’s upgraded model on the right. I’m very pleased with the result and glad I attacked this challenge. This was my first extensive kitbashing project. It sharpened skills I thought I did not possess. Now that I’ve raised the bar, I’ll need to super detail the two other Roundhouse WP 50-foot cars that are in my collection too: WP 12070 with end lumber door and WP 40018 with steel auto doors. Both will keep their 12-foot doors as did the prototypes. We thank Fred for sharing these upgrades to the MDC/Roundhouse box car kit. Are these MDC/Roundhouse kits still available? Great tip, I picked one up off of eBay for $11 with shipping. That brings up the question. Are the original Roundhouse lumber door and auto door-end doors true to WP prototype as is? Fix the grabs, stirrups, ladder, etc., and the model would be very nice looking. I want to thank Fred for a excellent article. For those of you wanting to build one like these, no’s 19205, 207, 210, 212, 223, 232, 246, 248, 249 & 19250 kept the 12′ doors. At least the opening was still 12′, so I guess there was no reason to alter the doors to 15′ then. The other 19201-19250 cars had a 15′ opening and 2.5 doors, like the model has. I love getting surprised with a version of a car I do not know about. Really good work on the doors and other details. I like little things like to two straps on the right side of the doors because the door is wider. Excellent! Thanks Bill, appreciate your comments. Car is now renumbered and dull coated, has a different appearance now. For more info and pictures check my Western Pacific Modelers Group: https://www.facebook.com/groups/WesternPacificModelersGroup/ (which is a restricted area, but you can join if you want). Well done Fred. This really turned out nice. You paid a lot of attention to the little details that really make this an outstanding model. One question is on the lower door track. Did you cut and bend it yourself? What thickness and size did you make it? Hi George, thank you. Lower door track is a piece of 1mm Albion Alloys L-shape brass, sanded to approximately half that size. I attached it to the plastic studs with canopy glue.